Mark (Variac) was nervous. So was everyone around him. Burning Amp 2009 had arrived - what would the weather be, would we have enough food, are there enough tables, but most importantly: would there be enough interesting visitors with interesting stuff to make it a success? Greeted by Mark’s wife Maria Elena, who took care of admissions and tickets, a crowd of DIYers started to flow into the Presidio Yacht Club that crisp morning of 18 October and immediately began to install their equipment in the demo rooms at the ground and first floors. Christian’s (cviller) wife Natasja, assisted by a generous donation by Elektor USA, had set up a well-stocked breakfast table with muffins, bagels and coffee for those who needed a kick-start that morning. Very soon, music started to flow from several systems installed at the ground floor as well as at the first floor where the presentations and some of the comparative listening sessions were going to take place. One system, looking kind of punk-steam-ish, was even installed outside so you never needed to be without music. As last year, several accomplished designers and audio personalities were attending BAF09, and I’ll get to that in a minute. But the bulk of the show was of course designs and projects by DIYers; from the very professional looking units by Ti Kan (AMB audio) and the wood retro looking stuff by, what’s in a name, “carpenter” to the steam-punk speakers on the outside deck. But rather than mentioning all of them, I’ll let the pictures do the talking. Audio diy attracts people with very different interests and capabilities. It’s not only the music reproduction, although clearly that remains the ultimate goal, and those of you who are familiar with for instance the writings of Daniel Levitin know how profound the influence of music on anybodies’ life can be and is. But it is also HOW you reach that goal, how your equipment is shaped and designed and realized. My personal interest is more in the engineering details of equipment and I typically spend more time analyzing and calculating and laying out circuits than in actually building them, which sometimes looks like an afterthought. 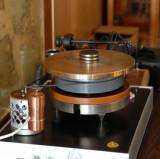 Many others however find great satisfaction in sourcing the best components they can find and afford, and constructing a piece of electronic or -as witnessed by Bill Berndt’s (berndt) fantastic turntable- mechanical physical beauty. Yet others build great speakers of astounding complexity. Audio equipment design in itself can become an art form, a synthesis of the music flowing from DACs and amps and speakers as well as the visually stimulating look of the realizations and, for the designer, the satisfaction of having successfully completed a project. The great strength of diyAudio.com is that it offers a home for any and all interests. Sure, discussions are often heated and emotional, but why should that be different from other walks of life? In the end, what counts is the appreciation of each other’s accomplishments, and enjoying the fruits of ones own and others’ efforts. (OK Mark, I’ll get off my pulpit now ;-). The range of technologies used was equally diverse: Mark Brasfield (audioman54), who until recently worked with Bob Pease at National, demo-ed a system almost completely build with National analog products, from LME49600’s and 49710’s in the DAC power supply regulators, via the LME49713’s in the amplifier input stages (metal can of course) to the LME49811 power amp Vas and driver stages. Only the DAC itself (AKM4396) and the output power darlingtons came from another manufacturer. At the other end of the spectrum was Jack (Electraprint) Elliano’s creation, demo-ed by his buddy Edwin Yang, with 211-type transmitting tubes in SE class A2 mode, outputting 45 Watts by (gasp!) driving the tube in grid current through a driver transformer. Jack Hidley of Audio Consulting Services has been an avid supporter of BAF from the first edition, and this year he brought many drivers and assorted goodies donated by NHT to be given away for free or a token donation. Jack also gave a presentation on the design considerations at the lower xover point in 3-way speaker systems. Because this xover point typically is around 80 to 150 Hz, it can be problematic as driver impedances can vary wildly in this frequency range and passive xovers don’t work well with varying load impedances. But Jack showed that if you carefully match the xover to the driver and the enclosure mechanical rolloff you can get a satisfactory solution. He had an interesting comment: that it is worthwhile to spend good money for xover and driver modeling software as even the best driver will suffer from a non-optimal xover, and trial and error is not only tedious but also doesn’t guarantee that you actually find the optimum solution. Nelson and Colin Pass had teamed up with John ver Halen of Lowther and Joe Cohen of Feastrex, bringing some large open baffles that could be equipped with different wide-range drivers, which they proceeded to assemble on-site. They brought Lowther PM5A’s as well as a pair of very expensive Feastrex Field Coil drivers. The baffles were also holding a 15 inch Eminence driver for the bottom end. One of the amps that were used to audition these speakers was Nelson’s latest creation, a nameless VERY simple amp that he designed and built just the day before BAF. (As a side note, I think audio DIYers need to shape up. Last year, I had to work on Mark’s F4’s until 05:00 AM before the show to make them play music. Now Nelson admits to finishing his amp just the previous day. And Kirkwood from Linear Systems topped that by saying he worked until 06:00 AM before the show to get his demo amp finished. What happened to ‘planning ahead’??). Nelson got in front of the blackboard with a piece of chalk and delivered his message: here was a new amp that anyone (even a lawyer, as one DIYer remarked) could build. There’s no longer any excuse that it’s too hard or too complex. This is the amp that brings instant success to anybody who wants it. This amplifier, which has finally acquired a name, the “DeLite”, has just one active device, an IXYS IXTH20N50 20A, 500V depletion mode MOSFET. Because it is depletion mode, biasing is automatic and with just a source resistor to linearize it, the amp delivered some 5W of high-quality sound. The thread is at: Pass "DeLite" Amp from BAF. Ian Beeuwkes did a great job of capturing Nelson live on camera at the event. Already a Group Buy for the MOSFETs is underway at DIYaudio, and a PCB should be no problem either as there isn’t any. That MOSFET and the few resistors, output cap and simple power supply can easily be wired up P2P in an afternoon. The load for the IXTH20N50 consists of a pair of light bulbs, hardly a difficult to source item either. (Hmm. Since the European Community is outlawing incandescent bulbs in Europe, does that make this amp even more wanted Over There?). DIYaudio’ ers who followed the Blowtorch threads are aware of the constant lamenting of the disappearance of those Toshiba very low noise JFETs. Unlike the weather, however, this was something somebody did something about: Linear Integrated Systems (LS) had samples of the N-channel LSK170, the P-channel LSJ74 and the dual N-channel LSK389. The singles are available at different IDSS value groupings, and after being prodded by John Curl, who is an avid user of those devices, Linear Systems has added a –D group to the LSJ74 with an unusually high IDSS range of 20-30mA. John thought that although in his view the Linear Systems devices were not quite as quiet as the Toshiba’s were, they were very good and he was happy that now there was also a higher IDSS version. Kirkwood Rough (Roadbagger) from LS demo’d a nice all-FET power amplifier with all Linear Systems devices up ‘till the output which used vintage 2SJ60 V-FETs. See Watt Sucking Fireball Series. Now if they would also start to manufacture those output devices…. As far as I am aware, there was just one piece of test equipment on show this year, David Gravereaux’s (davygrvy) Cone Gun. He brought a dismantled radar speed gun and pointed the beam at his speaker’s cone. Connecting the demodulated output of the radar unit to a scope showed him a wave form representing the cone excursion. The cone velocity is not high enough to generate a Doppler frequency, but the phase shift between emitted and received wave is sufficient to show asymmetric movement, and compression at high output levels was clearly visible. Wolfgang Klippel from Germany sells a similar system based on a laser interferometer, but that costs the far side of 50 grand…. One event that seems to belong to BAF since the beginning is the raffling off or plain giving away of interesting items. NHT as well Nelson Pass have a reputation here, but also supporting outfits like Elektor USA and Audio Amateur Corporation outdid themselves this year. I raffled off no less than 15 free one-year subscriptions to AudioXpress and Elektor USA, as well as stacks of books and CD-ROMs on audio and music. But also individuals were generous: one person pushed a couple of beautifully-made complete B1 circuit boards in my hand, asking me to raffle them off too. The uninitiated often look at audio diy as an irrelevant pastime like collecting stamps or watching football. But BAF 09 again showed that audio diy is unique, in the sense that even if you don’t make your career in audio, you can still contribute to it at a professional level. The participation of accomplished designers made that clear. Audio amateurs and DIYers spend lots of money and time to realize their vision with stamina and persistence, overcoming many a setback, and the reward is a great sounding and great looking piece of equipment or speaker. The recognition of your peers, whether it is on-line at diyAudio or at an event like BAF, makes it all worthwhile. diyAudio has more than 100,000 members, and clearly only a fraction could attend BAF. So, if you were among the 150 or so that DID come, you know that the diyaudio spirit was there, and you now know the answer to the questions at the beginning of this article: BAF 09 was a resounding success! Individual participant comments and experiences are in the thread http://www.diyaudio.com/forums/clubs...ml#post1953743. I for one am looking forward to the next edition in 2010, and rumor has it that there will be more listening rooms for even more relaxed listening. Be there, be counted at BAF 2010! Do you have an article that would be of interest to diyAudio members? Let us know! Last edited by Variac; 2nd April 2011 at 12:20 AM.